Like recent batches of Romaine lettuce, the stomach-churning word-salad served up about Apple over the past couple days doesn't appear to have anything to do with the issues the company actually, and specifically, detailed for its investors. In fact, virtually all of it appears to have been prewritten and simply queued up to have been printed whether or not Apple had issued any statement, or even if the company hadn't faced any problems in China at all. It's like a sentient broken record that can't stop playing itself. All the former business magazines that are now just branded blogs with contributor networks agree: Apple's problem in China this quarter is really evidence that "its devices are now so expensive and the improvements to them so minimal that many users prefer to fix them and postpone buying a new one," as virtually every one of these content mills plunked out as "news" this week. Quick, somebody tell the editors digging through Getty Images looking for photos of shriveled up apples to illustrate this commentary that "nobody is buying iPhones because they are so expensive and not innovating" that Apple is selling well over 200 million iPhones every year at an average price of nearly $800. And this quarter, that's driving an anticipated $84 billion in sales, even with critical Chinese sales skidding sideways. Again, as a reminder, this will be Apple's second-biggest quarter in history. Maybe you've heard us say this once before. Content generators: your personal theories are bafflingly stupid. Virtually everyone on Earth paying for a decent smartphone is voluntarily paying Apple a premium. The only reason Apple isn't dramatically expanding its iPhone sales every year is because there are only around a billion people on the planet who can currently afford to live an affluent "Designed in California" lifestyle. As a public company, Apple was legally required to reissue its guidance because of a material change. It clearly stated the primary cause of that material change: lower than expected iPhone sales in China--and it's not a mystery why demand for a variety of goods is sliding sideways in China right now. It's also affecting makers of things--like Ford--that are not premium-priced and don't really involve "innovation," so trying to reread Tim Cook's comments on demand in China through the lens of mistaken assumptions is rather foolish. While Apple volunteered a lot of comments about how it wished it could be doing better, they weren't all equally important factors. One of the comments made pertained to the generous subsidy Apple offered on battery upgrades through the end of December, giving existing customers the opportunity to replace their battery for $29 rather than $79. That clearly induced a lot of customers to take advantage of the deal, delaying an intent to upgrade to a brand new model. Rather than taking Apple's comment at face value, many pundits decided that this was exculpatory evidence for their cynical personal conspiracy theories that Apple had been working to degrade the use of older iPhones as part of a devious strategy to force new upgrades, making Apple no better than Google and every other Android maker that refuses to support their devices after the initial sale. No Android licensees are offering highly subsidized batteries to extend the use of their years-old Android products, but facts have no power to overturn the desperately held beliefs of those who really want to believe them. It appears that writers are largely just repeating their personal theories of what's going on without any actual evidence to support them. Those theories are also completely disconnected from anything Apple reported and have no grounding in what's observably happening. Take a look at these hot takes that are not even warm--nor capable of being taken seriously. Writers at the Verge have long worked to suggest that Apple is "virtually the same thing" as various Android licensees, equating it to the wildly dissimilar Samsung, branding Xiaomi the "Apple of China" and--well let's not even mention what they wrote about Motorola a few years ago. Its latest piece, working to serve as "coverage" of the Apple guidance note, ignores everything Apple stated to reiterate a series of cliche talking points that are simply false. "If there's one thing we've learned from Samsung's soft sales of the Galaxy S9 through 2018 and Apple's dramatically reduced forecast of iPhone revenues for the end of that year, it's that most people who want a great smartphone already have one," wrote Vlad Savov. That's something the Verge likes to repeat, but it's simply false. Repeatedly saying something doesn't make it true, even if it might sound convincing to people who aren't aware of what's actually happening. That's also the opposite of journalism. Samsung's Galaxy S9 didn't underperform because people "already have great smartphones." Rather, the flagship didn't reach expectations because--just like Google's Pixel models--there's simply very limited interest in Androidland for premium-priced handsets of any kind, largely because Android commodity can be attained for much less. The reality is that Samsung isn't really selling any fewer phones these days. It's just selling similar volumes of now mostly lower-end phones. Strike one on the facts, Savov. Second, Apple's revenue restatement has nothing to do with people "not buying a great smartphone." iPhones make up a majority of Apple's revenues. If iPhone sales were broadly crashing due to a lack of interest from a satiated audience, Apple wouldn't be forecasting quarterly revenues just 5 to 9 percent less than its original guidance. Outside of China, there is not a material iPhone demand issue, even if there are the business challenges that have always existed for Apple--including a strong U.S. Dollar. Apple has clarified that while new iPhone demand has been less than it expected in various markets, the "vast majority" of its change in revenue guidance was due to China and other emerging markets, not a global situation conveyed by the cliche truthiness that "people who want a great smartphone already have one." Strike two on facts. 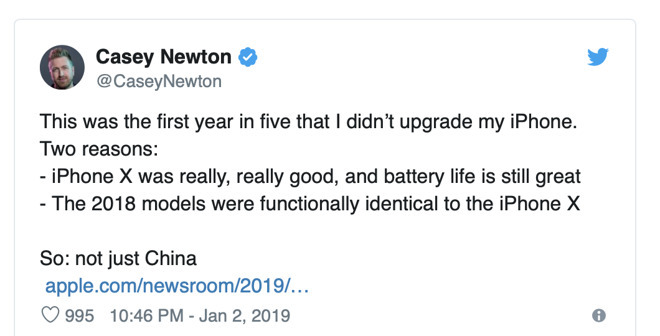 As "proof" that Apple was not really being honest about China in its statement to investors, Savov cited a fellow writer at the Verge who offered a personal anecdote about why he was not buying a new iPhone this year after years of annual upgrades. Of course, if his personal experience were representitive of iPhone buyers, Apple would have been selling a billion iPhones every year over the last five. These people aren't deep thinkers. One Verge editor illustrated his piece with a Tweet from a fellow writer demonstrating a loose grasp of logic. Now consider the difference in media coverage between Apple and the largest Android licensee: Samsung didn't warn its investors that its Galaxy S9 wasn't selling well until after its mobile revenues crashed. When Samsung issued its original revenue guidance for its most recently reported Q3 in October, phone blogs reported, "things look pretty solid. According to the report, the company is back on track by smashing another profit record." However, while Samsung Electronics as a whole did meet its guidance with revenues that were up 5 percent year-over-year, Samsung's Mobile IM phone segment actually crashed by 12 percent YoY in the last quarter, without any Applesque warning or explanation. In fact, that crash was not really a surprise because in the previous quarter Samsung's Mobile IM reported even worse revenues that were down by 22 percent YoY! There was no flurry of news reports belaboring the idea that Samsung Galaxy was on its last legs or that the company needed to make an emergency pivot into some new product category or was desperately in need of "innovation." Samsung's crashing phone revenues were covered up by its surging revenues elsewhere. 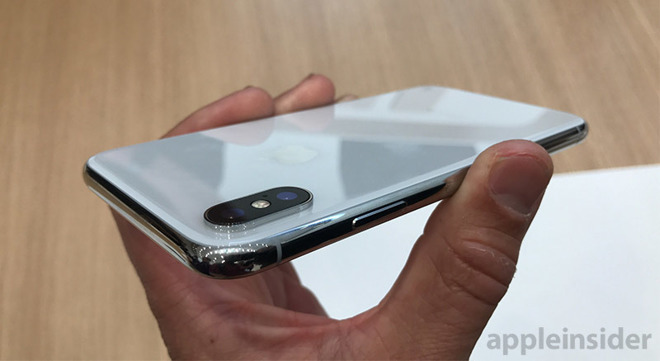 Somewhat ironically, this was due in large part to Samsung being the largest Apple supplier, albeit one that the "Apple Supplier" Watchers like to ignore because it's doing quite well selling flexible OLED panels and other high-end components to Apple--which is making tons of money selling finished iPhones. That fact is a serious problem for the "iPhone-is-doomed, supplier data indicates" media narrative, so they just omit it. But it's a fact, and "nobody is buying smartphones anymore" is simply not a fact. The crashing phone revenues at Samsung are not even comparable to Apple's lowered guidance. Nobody ripped their garments apart when the world's largest Android licensee posted a 22 percent and then a 12 percent drop in its actual smartphone-centric revenues with no guidance warnings at all. Additionally, Apple isn't expecting to post a 5 to 9 percent drop in either iPhone or total revenues. It announced a 5-9 percent drop from its original guidance. Apple now expects to report about $84 billion in revenues in Q1, compared to its record year-ago Q1 revenues of $88.3 billion. That's a revenue decrease of less than 4.9 percent YoY, significantly less than half of the 12 percent crash Samsung Mobile IM suffered last quarter without anyone even noticing, let alone causing any faces to melt, and not even comparable to the 22 percent crash that the media shrugged off in October while only modestly acknowledging that the Galaxy S9 wasn't exactly a hit. Samsung IM Mobile's percentages of revenue change are based on smaller numbers; Samsung ships many more phones than Apple while generating less than half the revenues, and its calendar Q2 and Q3 are much smaller than Apple's fiscal Q1 ending in December. But Samsung's roughly $5.5 billion hit in revenues in Q2 on its flagging flagships is far harder to recover from than the $5 to $9 billion guidance shortfall Apple outlined. Apple also has booming iPad, Mac, Watch and Services businesses that Samsung effectively lacks entirely, and even with significantly slower sales in China, Apple will still be bringing in $84 billion in revenue at the same profit margins it has been earning. That means Apple was grazed by the bullet of weakening Chinese demand while Samsung has been taking a solid punch directly to the gut every quarter. So why are pundits freaking out about Apple's relatively minor shift in expected guidance, while shrugging off Samsung's even larger hits against a much smaller and far less profitable business—like in Q2, when Samsung IM earned $2.2 billion while Apple reported profits of $12.612 billion? It's because they are content clickbait generators charged with whipping up the web into a frenzy of social network interactions to support surveillance advertising, that aren't really that interested in talking to their readers about what's actually happening. So, everything The Verge opened with was straight up false. But it kept going, claiming falsely that Tim Cook's letter to investors "can be summed up as 'too many good phones already out there.'" False again, that's strike three. That's the opposite of the statements Apple has been broadcasting for some time now. And it's just not true at all, if you define truth as being supported by significant, observable facts. Apple has devoted significant time at its last few media events from WWDC to Brooklyn outlining that its installed base of satisfied users is not the fearsome negative that analysts keep depicting it as. Instead, Apple views this as entirely desirable and actually works to make sure that existing iPhones remain usable and in operation for as long as possible. It's been doing this via iOS upgrades that have long supported iPhones for four years or more in an industry that can't manage to deliver Android updates for even 18 months. Apple's articulation of its "planned anti-obsolescence" blew peoples' minds because it's completely opposed to the cynically-cliche idea that Apple is working to sabotage existing devices with fatty iOS releases and battery shenanigans that make older phones feel like they need to be replaced, just to sell more iPhones. If that's the case, why has Apple been supporting five-year-old iPhones with every iOS release? In fact, a major driver of iOS 12 involved work to make it more efficient on older iPhones. Apple isn't having problems selling new iPhones the way that GoPro ran into with its cameras--facing a relatively small addressable market that grew content with the one action camera they bought for quite a long time. If Apple had the GoPro problem, it wouldn't be able to be introducing ever more expensive new models! Apple has been selling over 200 million iPhones every year since 2015, even as its product portfolio has trended higher into more expensive models. That means Apple is regularly upgrading a large percentage of its installed base. It also refutes another tired media narrative that insists that Apple's prices are too high. If that were the case, iPhone sales would be collapsing like Samsung's and its Average Selling Price would be eroding along with Androids, not growing toward $800 in a sea of $250 Android commodity. If buyers thought iPhones were priced too high, the ASP of iPhones would be trending downward. Apple sells a broad range of iPhone models at different price tiers. It is impossible to coherently argue that customers can't afford $999 iPhones as the largest segment flocked to iPhone X. 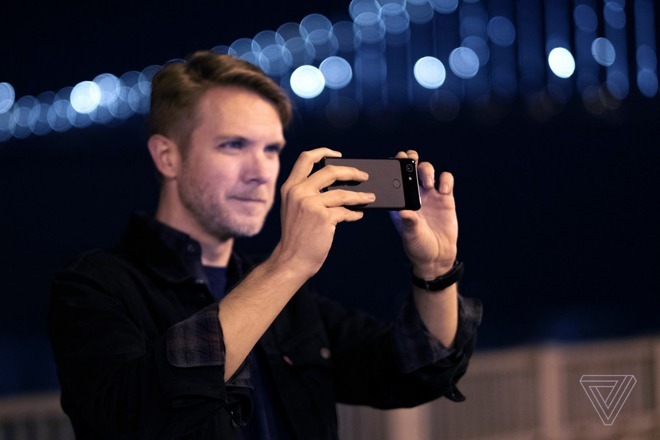 This season, the newest, premium priced lineup of iPhone XR, iPhone XS, and iPhone XS Max each found the largest segments of demand from users. That's not the case for Samsung or other Android licensees, which only sell a tiny number of premium handsets while sitting on high volume sales of low-end devices. For about a billion iOS users, the more than 200 million new iPhones Apple sells every year means that about a fifth of Apple's installed base upgrades in a given year. Some upgrade every year, some wait three years or more or until some feature grabs them--or until they break their old one beyond repair. But the overall percentage remains at about a fifth. That tells us that Apple doesn't expect any large percentage of its brand new iPhone X users to rush out and buy an iPhone XS upgrade. 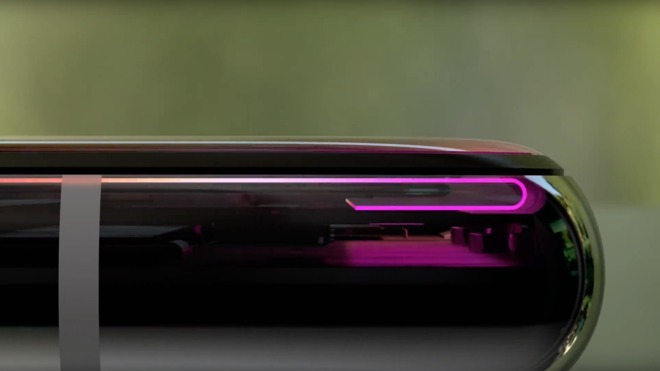 Rather, it again expected to woo about a fifth of its entire installed base to get either a new iPhone XS; or the big new iPhone XS Max; or the new, affordable iPhone XR; or perhaps an older model that's still a nice upgrade to users of an iPhone 6s or earlier. And, it appears to have accomplished this, everywhere else in the world but China. Every time Apple changes its lineup, it has to recalculate where it expects demand to lie and what consumers will find valuable at any given price point. This year that math was complicated by various factors. China's lack of economic growth played a bigger role than anticipated. The fact that Apple is now saying its initial estimates from three months ago were only off by 6 to 9 percent indicate that the company has a pretty good grasp on what the market wants and will pay. The fact that Apple is beating itself up and holding meetings to determine how to do better doesn't mean the company is facing a fearsome doom; it means that it's a relentless perfectionist. It's like the professional ice skater that flips and twirls through a series of impossible tricks, only to be upset that she didn't land one planned maneuver perfectly. As with unit sales reporting, observers would never notice anything is wrong if Apple didn't transparently outline its invisible internal issues in SEC reports and notes to investors. Note that in Androidland, no licensee has ever reported its units sold; there is no scrutiny of Samsung's massive faceplants whether losing over $5 billion in lost Galaxy S9 sales this summer or burning up $5 billion in Note 7 fires earlier. The media only ever makes excuses for Samsung's visibly sloppy ice performances, and most of the world's Androids are now produced by Chinese production factories and don't have to report revenues or any data about their financials. One of the favorite cheers of Android promoters is that these companies are generating market share on volumes of devices sold. Unfortunately, one quarter of "share" is a Pyrrhic victory for factories that produce large volumes at near zero profits. That's because buyers are just as likely to buy their next Android from another commodity factory. There is no loyalty in Androidland, no reason for Android licensees to even try to keep old phones working, no point to subsiding battery replacements, and no hope for any licensee to ever build an installed base of loyal buyers. It's a vicious cycle of self-defeating greed and cheap efficiency that's effectively cork-screwing a hole for itself into the ground. The Verge entirely misses this. Instead, it kept hammering on the tired and incorrect idea that "nobody is buying smartphones anymore," before inevitably turning its story--ostensibly about Apple and Samsung--into a native advertisement for a camera feature of Google's Pixel: a phone that isn't being purchased in any volume. But that trite word salad is not just ineffective advertising for Google, it's obviously false--Samsung is still selling vast volumes of phones, it just isn't making money or reaching premium buyers. At the same time, Apple is still selling peak volumes of iPhones while making almost all the money in the industry by effectively reaching premium buyers. "Nobody is buying smartphones anymore" is the kind of nonsense that actively prevents readers from understanding what's really happening. It's not remotely true. Mobile phone buyers are also not just waiting for a compelling technical "innovation" upgrade, another trite bit of cliche analysis The Verge repeated. A big percentage are breaking their phones, or losing them, or are simply upgrading to get the new color they want. Tech reviewers think that they are representative of the public and that the mass market is keenly interested in chips and RAM or a photo feature Google is promoting. If that were the case, how has Apple been successfully selling a Product(Red) iPhone and iPod for all these years, and why isn't Pixel finding buyers? Have Android promoters never set foot in a store? Do they think nobody buys jeans anymore just because there isn't any apparent technical innovation occurring in pants-making? Do they imagine that nobody buys TVs anymore because everyone must already have one by now? Do they wonder why people buy shirts that cost more than the component fabric that occurs on the garment's bill of sale? What is it about Apple that turns the most mundane discussion of financials into an illogical tirade of hyperbolic derangement? M.G Seigler, writing for 500ish.com took a series of his tweet storm-hot takes on Apple's Q1 and condensed them into a blog posting that effectively insists that the company desperately needs to show growth, and now that iPhones aren't growing materially, it has to really get on the ball with Services. Prescient! Except that iPhones haven't really been growing since they first passed up 200 million per year back in 2015. This isn't news. It isn't insightful to look back on the last four years of iPhone sales and repeat cliche ideas like the "law of large numbers" to explain that there's not another China on the brink of delivering a new American-sized batch of middle class consumers. It's also not brilliant to point to Apple's Services strategy of the last few years and say "hey, Apple better actually do this thing it said it would. The thing it regularly indicates that it is successfully doing! Listen to me, I got so many answers." The technorati all talk about how Apple's CEO isn't very visionary and has an "innovation problem," and then turn around and are starstruck by the sheer brilliance of these bloggers regurgitating the same Captain Obvious fluff, mixed up with their full-on delusion about "pricing too high," as if Apple would be really set for success if it had instead engaged in a pricing war with Android licensees and established to consumers that iPhones are only worth at most $400. Today Apple could lower prices if it needed to. In an alternative scenario where iPhone prices were already margin-bustlingly low, Apple would have no options. Good thing Apple doesn't follow the advice of pundits and analysts who were screaming from the rooftops that the real solution to China was a $300 iPhone. We'd never have gotten iPhone X. Is this the end of Apple or Apple punditry? 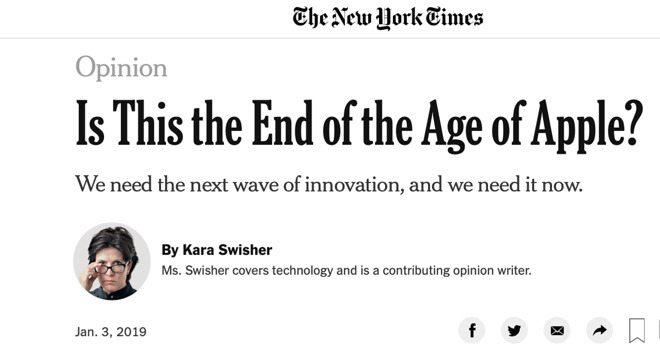 Kara Swisher, hot on the heels of announcing that "the innovation cycle has slowed down at Apple," and asking "Where is their exciting new product and where are their exciting new entrepreneurs within that company?" turned around and wrote an entire piece for the New York Times that meanderingly accused Apple and the tech industry at large of suffering from an apparent lack of innovation. "Apple has hung the moon for investors for so long now that the idea of the company struggling sent the entire global stock market into a paroxysm of fear and plunging indexes," Swisher wrote. That's colorful language, but what does it mean? Apple has been perpetually dying to analysts and investors since the 1990s. It has turned in quarter after quarter of insane performance for years, only to be rewarded with a staggeringly low stock valuation that assumed zero growth in the future. Even when hitting the trillion dollar market cap last fall, Apple's shares were still priced in the toilet relative to the Price/Earnings of any of its peers. Over the last decade of Apple's indisputable iPhone super success cycle, the company's stock has repeatedly crashed in half as investors and high-frequency trading bots were persuaded to sell shares for nothing on the news that Apple had run out of "innovation." How can you write about Apple's most recent stock panic without even the most basic awareness of 2008, 2013 and 2015? "There is no question that Mr. Cook and his team have done a tremendous job taking advantage and managing this last cycle of innovation, but it's apparent that it's now winding down," Swisher wrote, painting a picture of a world where there's nothing left to invent or develop or design, and certainly nothing that could be commercially successful. What incredible logic: Apple has apparently hit so many home runs that it is clearly out of home run hitting potential. Swisher sounds like she's channeling John Dvorak, writing his famous 1984 screed that "the Macintosh uses an experimental pointing device called a 'mouse.' There is no evidence that people want to use these things." It might be time to change the tune about Apple. It wasn't pundits who thought up the potential of iPhone, or the App Store, or iPads, or Machine Learning, or Augmented Reality, or any of the wildly innovative, technological underpinning features in silicon firmware, in software, in mass production assembly and in every other discipline that non-technical people simply take for granted. It was individuals at Apple who came up with this stuff while being ceaselessly derided for being "devoid of innovation," as if that phrase is inherently clever to scribble out into words or call in to CNBC on a "why Apple is doomed" expert interview. News flash: it's not. It makes you sound like an idiot. It's a catchphrase for incompetent nincompoops, which is why it's also a favorite cliche among stuffed shirt analysts and pundits with nothing valuable to say. Step back and watch the accolades among other Twitter accounts praising the attestation of Apple's "innovation problem," like a congregation of the faithful applauding each other's beliefs because they all want to believe the same set of ideas. Amen! Makes no sense but let's say it again, Apple isn't innovative! Preach! Few pundits have ever accurately seen anything coming apart from the PR they're handed to propagate. Remember the platitudes for the prospects of Motorola and "innovations" like Google Glass?. Why should they be expected to be able to see what's next today? And why is the common, unanimous opinion that nothing new is likely to ever happen in the future--and certainly not at Apple, with its big problem of "not being innovative"--why is that worth anything at all? 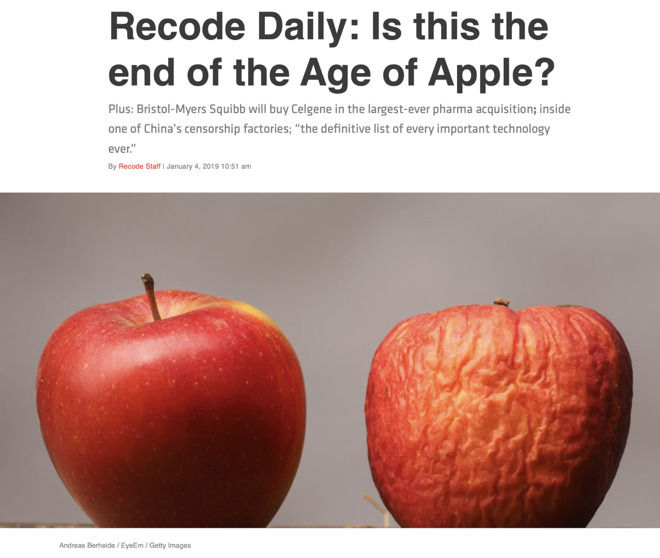 Bloomberg, after publishing a bombshell report that at this point appears to have been invented by an imaginative writer and presented as factual without credible sourcing--and then failing to substantiate the story or retract it--rushed in next to accuse Apple of lying about its prospects in China. Supposedly, Apple has done so with the goal of embarrassing itself with the need to restate its quarterly guidance. On the conspiracy-level meter, this one breaks the machine. "Apple failed in the No. 1 mission of being a public company: being honest with investors about its business," Shira Ovide crowed for Bloomberg, barely a year after the company published a flurry of other false coverage that clumsily misread data supposedly sourced from Apple's supply chain to insist that iPhone X wasn't selling well anywhere. You might say Bloomberg "failed in the No. 1 mission of being a media company." Must be fabulous to be able to scribble up any old irresponsible garbage without consequence, and still have other media wonks treat you with respect for simply continuing to publish your musings, as long as it remains bitterly critical of Apple. Say any baseless lie with overt arrogance and you can be anything you want to be in America.